What is this treatment going to cost? This is the question at the forefront of every patient’s mind when we begin discussing a treatment plan. I do my best to “ballpark” the amount when we are in the brainstorming phase of treatment planning and we hone in on the amount when the plan begins to take shape. Below is a good article from the Academy of Dental Implants. Utilizing implants as part of a comprehensive treatment plan allows us to restore any patient to a great aesthetic and functional dentition. We refer to https://centralmassoms.com/ for all of our dental implants. A dental implant may cost no more than other treatments to restore a tooth. A dental implant may even cost less than other tooth replacement options. Because a dental implant typically lasts longer if you use a dental implant dentist who has proven skills, education, and training (find one near you). 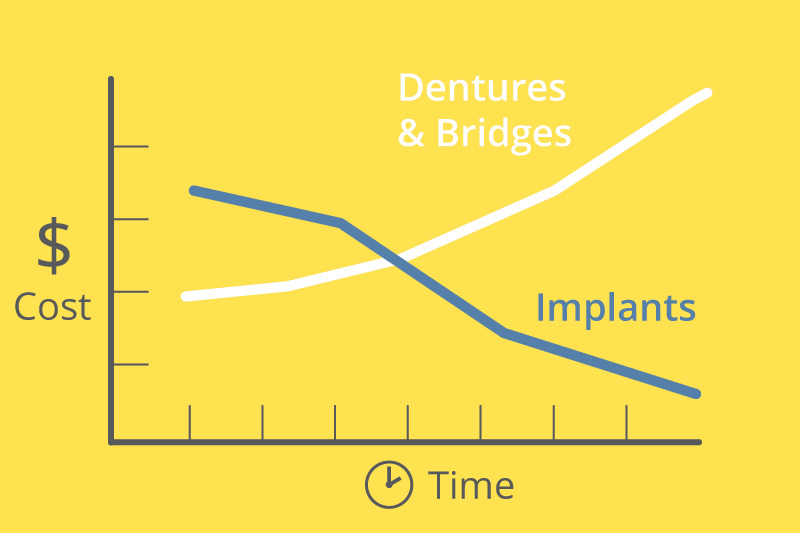 Dental implants typically cost less than a dental bridge long term because a bridge has higher maintenance costs. A dentist who is experienced in tooth replacement can explain the reasons. A note of caution before we get into the implant cost details: if someone gives you a price without seeing your mouth first, be wary. Dental implants are customized for your mouth. An experienced implant dentist knows that no two patients or their dental implant treatments are exactly alike, so the number of appointments, procedures – and costs will vary accordingly. Why pay “list price” for the worst-case scenario when you can get a dental implant price that is based on your situation? With that in mind, The New York Times estimated a cost range for a single tooth implant to be $3,000 to $4,500. But the way for you to get the lowest possible cost is to contact a credentialed dental implant expert. The important aspect here is the “credentialing” because credentialed implant dentists have documented levels of training, experience, and education. Any dentist can say “Sure, I can do implants,” but a credentialed implant dentist has proven experience. This means they have information available that will help keep your cost to the minimum. What If You See Ads with Very Low Prices for Dental Implants? You might think these dental implant prices are too good to be true. Well, you know what they say about something sounding too good to be true… The key is to ask the right questions of an implant dentist you know you can trust. Be certain that the treatment you are getting is not just complete but is truly customized for your mouth and oral health needs. For example, does the price include bone augmentation, soft tissue treatment, extraction if needed, the abutment, the crown, and a provisional, immediate load? Ask where the crown is manufactured, what the size of the implant is, etc. That is why the AAID Credentialed Implant Dentist was created – so you can trust your implant dentist to plan the treatment that is safe and best for you both now and in the long term. Don’t presume that every dental implant dentist is credentialed. You should always ask an implant dentist: “Are you AAID credentialed?” You’ll sleep better when you do because you will have peace of mind. Here is a free directory of pre-qualified, credentialed implant dentists from the American Academy of Implant Dentistry, the U.S. authority on dental implants. Just enter your zip code and you’ll find credentialed implant dentists near you. So here is the key to the lowest dental implant cost: Use a proven, experienced implant dentist to help ensure the dental implants last. Do that and you can get great value. Unlike many other tooth replacement options such as dentures, dental implants are highly customized to look, feel and act like your natural teeth. That is one of the reasons people love their dental implants! But that is why to give you the best value, a dental implant dentist needs to see your mouth instead of guessing. For example, how many teeth is the patient missing? Are the missing teeth located next to each other? What is the health of their jawbone? All of this affects how much a dental implant costs. The questions that an experienced dental implant dentist will ask you are for your safety and successful treatment. These questions can also help minimize your cost. Why pay for the “average” implant procedure if that isn’t what you need? Finding an implant dentist you can trustis the key. You should be very careful if someone offers an exact price for dental implants without seeing you. An experienced dental implant expert knows the dental implant process is highly personalized for you. So what is a tooth implant cost / dental implant cost? The best answer is to ask an experienced, proven implant dentist near you. They can minimize your costs after they have examined your mouth and existing teeth in person. You should also make it a point to ask any dentist, “Are you credentialed by AAID?” AAID credentialing means the dentist has met key standards for experience, training, education, skills, and competence. You can find a trusted, credentialed implant dentist near you using this free directory. Be sure to ask if they are credentialed by AAID because this will give you peace of mind – and confidence you are getting the best value. While the cost of dental implants can’t easily be guessed without seeing you, one point is clear: the long-lasting nature of dental implants can make them an excellent value. In fact, dental implants can be very cost effective compared to many other tooth replacement options. 1) Dental implants won’t embarrass you. Dental implants from a proven implant dentist give you complete confidence that you can eat without being self conscious because they function similar to your natural teeth. In contrast, non-implant tooth replacement options such as dentures may make eating difficult, and they may reduce your ability to taste foods fully. Even worse, because dentures are not affixed to your jawbone, they could slip or click while you laugh, cough or kiss. In contrast, a tooth implant gives you peace of mind because it won’t slip. Tooth implants, or dental implants, become part of your jaw structure, making it easy for you to enjoy the company of others without fear of embarrassment. 2) Dental implants will give you a natural-looking smile. Can you tell when someone is wearing dentures? Perhaps their gums don’t look quite right. Or perhaps the dentures don’t seem to fit the natural shape of their mouth. Dental implants from an experienced implant dentist give you the most natural look and smile of all tooth replacement options. That is because they are inserted by dental implant experts in a way that fits your unique mouth structure. As a result, they look more like your own teeth than other replacement options. Even better, dental implants feel like your natural teeth. Unlike many other replacements for missing teeth, dental implants have a shape and sensation similar to the rest of your teeth, with no extra wings or bridges. That’s a great reason to show off your beautiful, natural-looking smile! 3) Dental implants can help you stay heathy. Dentures and other non-implant tooth replacement options may also feel less natural to your body, and it may react to the loss of your tooth. Specifically, you may begin to lose bone in your jaw, leading to long-term changes in your jawline and looks. Dental implants by credentialed implant dentists are superior tooth replacement options in this regard, because they are embedded directly into your jawbone. This provides your body with the stimulation it expects, so the body responds by continuing to keep your jawbone – and your looks – robust and healthy. Dentures can also trap food particles between your gums and the dentures themselves. This can lead to the growth of bacteria, which in turn can contribute to gum disease and bad breath. Dental implants, on the other hand, act much more like your natural teeth. 4) Dental implants are convenient. Once you have replaced your missing teeth, you want to get back to life. Dental implants help you do so, as they are durable, and may even last a lifetime. In contrast, dentures may need to be replaced more frequently. Over time, dentures can also become worse fitting due to changes in your facial structure as you age and lose bone in your jaw. Of course, one of the most unpleasant tasks associated with dentures is cleaning: dentures require removal every night. In comparison, dental implants can be flossed and brushed just like your natural teeth. Talk to a dentist experienced in tooth replacement, and they can give you more information about the pros and cons. Dental implants can be very cost effective versus other tooth replacement options. But there are many other great reasons for choosing dental implants, including peace of mind in social situations, robust health, and convenience. Keep in mind that due to the sophisticated science of dental implants, it is important that you choose a dental implant expert. AAID offers a searchable directory of credentialed implant dentists. These dental implant experts have met key educational, training, and competency standards that will help them give you a great implant experience. Learn more about How Much Are Dental Implants?